Sam Houston, by W. B. Cooper, 1845. Tennessee governor and Texas hero Sam Houston was born to Samuel and Elizabeth Houston in 1793 near Lexington, Virginia, and raised with five brothers and three sisters. His father, a militia colonel, died in 1806. The following year, his mother led her family west, settling near Maryville, the seat of Blount County. Never comfortable with his family, the all-but-unschooled, hulking teenager frequently wandered away and lived with a band of Cherokees for long periods. Their leader, Oo-Loo-Te-Ka, became a surrogate father, teaching Houston the language and ways of the Cherokees. Once, while living in Maryville, Houston opened and taught in a school, but becoming bored, he joined the army in 1813. He rose swiftly from raw recruit to become an officer. Serving in the Seventh Infantry, he participated in Andrew Jackson’s Creek Indian campaign and received two severe wounds at the battle of Horseshoe Bend in 1814. His conspicuous bravery brought him to the attention of Jackson, who posted him to his regional headquarters near Nashville after the war. There, Houston became enmeshed in politics as a member of Jackson’s famous “Tennessee Junto,” a powerful political machine devoted to furthering the general’s career. In 1817 Houston won appointment as sub-agent to the Eastern Cherokees, but ran afoul of Secretary of War John C. Calhoun, who became a lifelong enemy. Houston quit the army in 1819 to study law in Nashville. He opened his practice in Lebanon to be close to Jackson. That same year he was named adjutant general of the Tennessee Militia, and was soon attorney general for Davidson County. With heavy support from Jackson and his machine, Houston won election to the U.S. House of Representatives, using his position to champion his mentor’s bid for the presidency. After serving a second term, he successfully ran for governor in 1827. At age forty-one Governor Sam Houston stood on the brink of a national career, but his own character flaws undermined his chances. Over the years Houston had acquired a legendary drinking problem; public drunkenness virtually became his trademark and caused growing concern among his admirers. While campaigning for a second gubernatorial term, Houston married Eliza Allen of Gallatin after a scandalously brief courtship. When this daughter of an old, politically powerful Tennessee family left him after less than eighty days, Houston’s future in the state became bleak. Humiliated, he resigned the governorship and fled the state in disguise to join his Cherokee friends, by then resettled in Indian Territory in today’s Oklahoma. There, near the border with Mexican Texas, Houston took an Indian bride, became a trader and Cherokee citizen, drank, and fantasized about freeing Texas and becoming a millionaire. Fronting for New York financiers engaged in Texas land speculation, Houston crossed the Sabine River and settled in Texas in late 1832. He established a law practice in Nacogdoches, dabbled in politics, and plotted rebellion against Mexico. When tensions between Mexico and the largely Anglo-Saxon settlers of Texas boiled over in 1835, the settlers made Houston one of their military leaders, conferring the rank of major general. After the Texans suffered defeats at the Alamo and Goliad, however, Houston retreated to restore the fighting ability of his “army” before finally turning to attack a large Mexican force at San Jacinto on April 21, 1836. Painfully wounded, the Texas general led his outnumbered forces to victory. With the U.S. Congress unwilling to admit Texas as a state, the voters overwhelmingly elected him president of the Republic of Texas. Houston did not seek immediate reelection. He served in the Texas congress and in 1840 married Margaret Lea of Marion, Alabama, with whom he had eight children. Reelected president in 1841, he spent his second term working to achieve annexation to the United States, which occurred in 1845. In 1846 he won election to the U.S. Senate, where he served until 1858, making a name for himself as a strong Unionist, a promoter of the transcontinental railroad, and a critic of the army. He campaigned (though somewhat tepidly) for the presidency in 1852, 1856, and 1860. Texas secessionists made it clear in the late 1850s that they could and would prevent a third senatorial term for Houston. He returned to Texas and traded on his tremendous popularity to win the governorship in 1859. 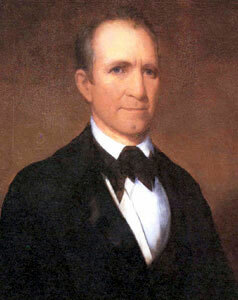 Governor Houston worked to prevent Texas secession. He even counseled that if Texas left the Union, it should revert to the status of independent republic rather than join the Confederacy, which he correctly foresaw as leading to war. To his surprise and dismay, most Texans clamored for secession and the Confederacy, and Houston resigned after the Texas secession convention and plebiscite in March 1861. Texas authorities watched him closely, fearing that the charismatic and popular Houston might attempt a coup. When he died in July 1863, Texas secessionists breathed a sigh of relief.